This is a dish that works well for busy times. It's easy, fast, healthy and vegetarian but tastes rich and indulgent. 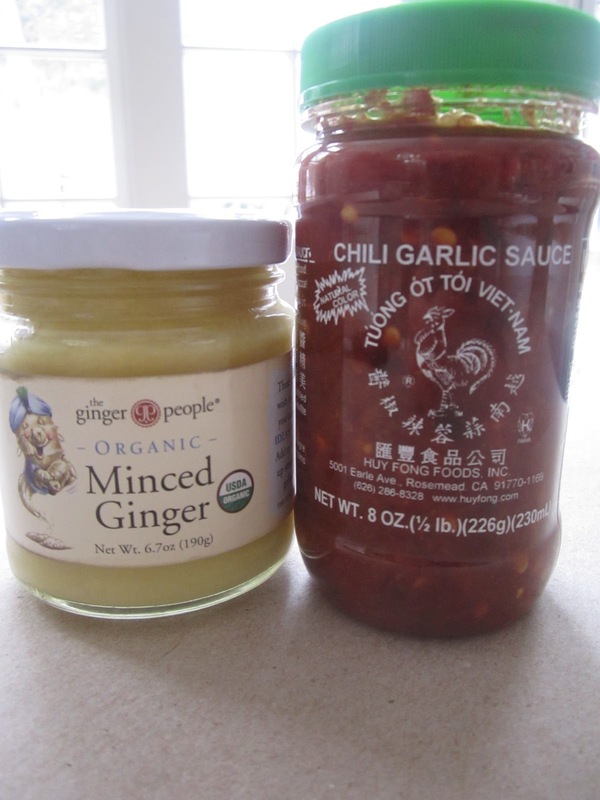 You can make it ahead of time and serve it hot or cold (it warms up well in the microwave). I've made several variations of peanut noodles over the years including one with 13 ingredients just for the sauce! I really like this one, a variation on a recipe given to me by a friend who has a knack for simplicity. Once you get the ingredients, they can sit on your shelf and in your refrigerator for a long time and be ready when you need them. 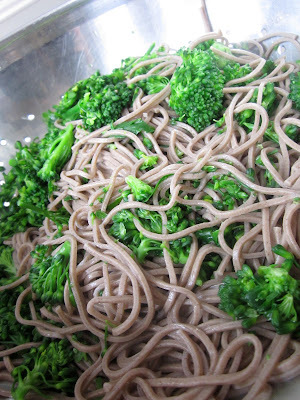 The noodles can be soba, udon, spaghetti or whatever noodley taste and texture you like. I blanch the broccoli in the pasta pot towards the end of the cooking time so they're a tad crispy, but not mushy or raw. The peppers and onions are bright and crunchy and so good. Note: Broccolette are long slender stems of broccoli. If you shop at Costco, you've probably seen them. I think they're great because the stalks are tender and quite edible. 1. Put all sauce ingredients in a blender and blend until smooth. 2. Chop broccolette or broccoli into small florets. 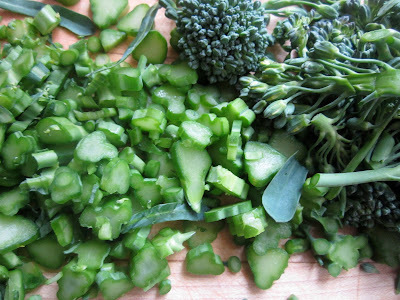 Chop stem into tiny pieces (so they cook in same amount of time as florets) If you're using broccoli you may need to shave off the tough top layer with a vegetable peeler before you dice it. Cut red pepper into thin strips, discarding stem and seeds. Trim root off scallions and slice thinly. I use both white and green parts. 3. Bring a large pot of water to a boil and add noodles. Cook according to package instructions, adding broccoli for the last minute or two. Reserve 1/4 cup of the cooking water to thin sauce if needed. Drain briefly in colander, then dump into a big bowl, add sauce and gently mix (initially it may seem like a lot of sauce but the noodles will absorb it). Add peppers and scallions and toss again. Serve hot, room temperature or cold. there's no reason not to use them. Blanching the broccoli with the noodles makes this so easy.